Cook In / Dine Out: Red Oranges? On most days I have half a navel orange with cereal for breakfast, which I cut into 1/8 wedges. But Monday's orange took me by surprise since it wasn't, well, orange. It was red! At first I thought I'd picked up a small grapefruit by mistake, but then I looked at the sticker, which said it was a "cara cara" orange. 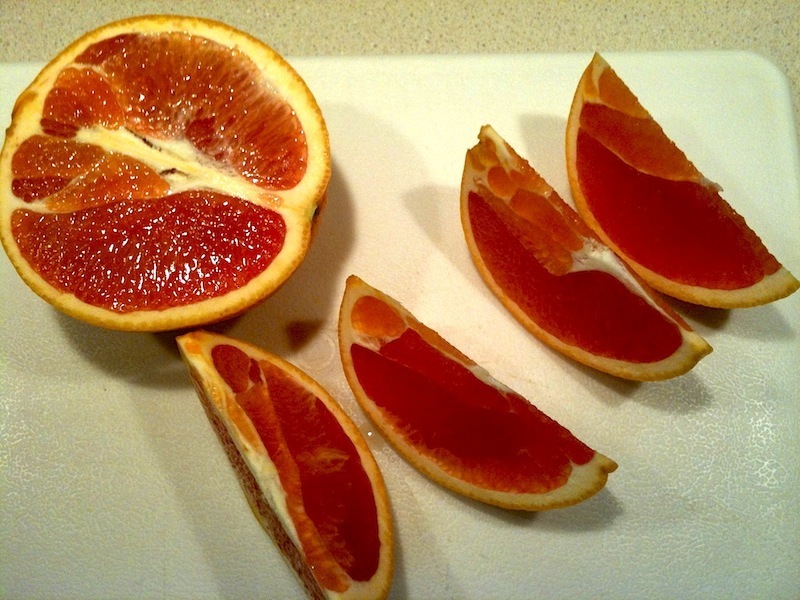 Sure enough, the cara cara is a type of navel orange with red flesh. I'm really surprised that Giant would stock that, since until this week, I've only ever gotten the traditional orange oranges from them. It tasted just like any other decent orange and not like grapefruit, despite the color. If you've never had one and see it in the store, give it a try. I recognize that cutting board!